Atlanta metropolitan area or metro Atlanta, is the most populous metro area in the U.S. and the ninth-largest metropolitan statistical area (MSA) in the United States. The Atlanta metropolitan area spans up to 28 counties in north Georgia and had a total 2010 population of 5,268,860, and is the ninth largest metropolitan area in the U.S. Atlanta, Georgia’s capital and largest city, is major business city and the primary transportation hub of the Southeastern United States (via highway, railroad, and air), with Hartsfield–Jackson Atlanta International Airport being the world’s busiest airport since 1998. The World Cities Study Group at Loughborough University rated Atlanta as an “alpha(-) world city.” With a gross domestic product of US$270 billion, Atlanta’s economy ranks 15th among world cities and sixth in the nation. The city is a center for services, business, higher education, information technology, and finance. 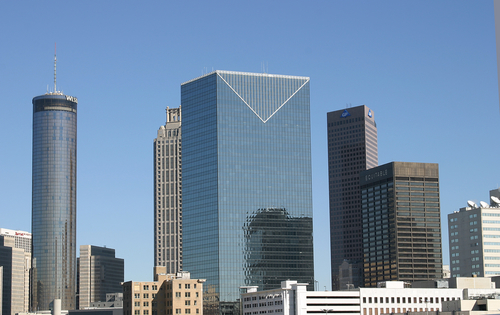 Atlanta contains the country’s third largest concentration of Fortune 500 companies, and more than 75 percent of Fortune 1000 companies have business operations in the metropolitan area. The region hosts offices of about 1,250 multinational corporations. As of 2006 Atlanta Metropolitan Area ranks as the 10th largest cybercity (high-tech center) in the US, with 126,700 high-tech jobs. As of 2010, Atlanta is the seventh most visited city in the United States, welcoming over 35 million domestic and overseas visitors per year. Atlanta is the world headquarters of corporations such as The Coca-Cola Company, Turner Broadcasting, The Home Depot, AT&T Mobility, UPS, and Delta Air Lines. Other headquarters for some major companies in Atlanta and around the metro area include Arby’s, Chick-fil-A, Earthlink, Equifax, Gentiva Health Services, Georgia-Pacific, Oxford Industries, RaceTrac Petroleum, Southern Company, SunTrust Banks, Mirant, and Waffle House, NCR and First Data. Atlanta is home to many cultural institutions and exhibits, and its population is made up of various ethnic and religious backgrounds. The city contains a large and growing international community, with foreign-born people accounting for 13 percent of Atlanta’s population. Atlanta has a humid subtropical climate, (Cfa) according to the Köppen classification, with hot, humid summers and mild winters that are occasionally cold by the standards of the southern United States. January averages 42.7 °F (5.9 °C), with temperatures in the suburbs slightly cooler. Warm, maritime air can bring springlike highs while strong Arctic air masses can push lows into the teens (−11 to −7 °C). High temperatures in July average 89 °F (31.7 °C) but occasionally exceed 100 °F (38 °C). Atlanta’s high mean elevation distinguishes it from most other southern and eastern cities, and contributes to a more temperate climate than is found in areas farther south. Atlanta is home to professional franchises of three major team sports: the Atlanta Braves of Major League Baseball, the Atlanta Hawks of the National Basketball Association, and the Atlanta Falcons of the National Football League, The original Atlanta Beat of the Women’s United Soccer Association (WUSA, 2001–2003) was the only team to reach the playoffs in each of the league’s three seasons. Atlanta is also home to the Atlanta Silverbacks of the North American Soccer League (men) and W-League (women). The city is supposedly also being considered for a potential expansion team in Major League Soccer. In golf, the final PGA Tour event of the season that features elite players, The Tour Championship, is played annually at East Lake Golf Club.